Although most of the work we do is based around digital design and websites, we do sometimes work on more traditional graphic design jobs. Of course, we offer business cards to our clients and can produce a design for customers that compliments their website, but every now and then we receive a request for a print ad or a poster. 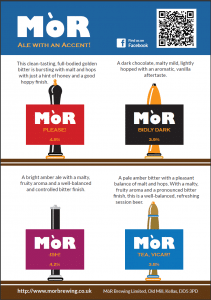 MòR Brewing approached us as they needed an A5 colour advert for a promotional guide being published. The brief was that the purpose of the ad was to build the MòR brand in the minds of the buying public and also the pub landlords & buyers who order beer. 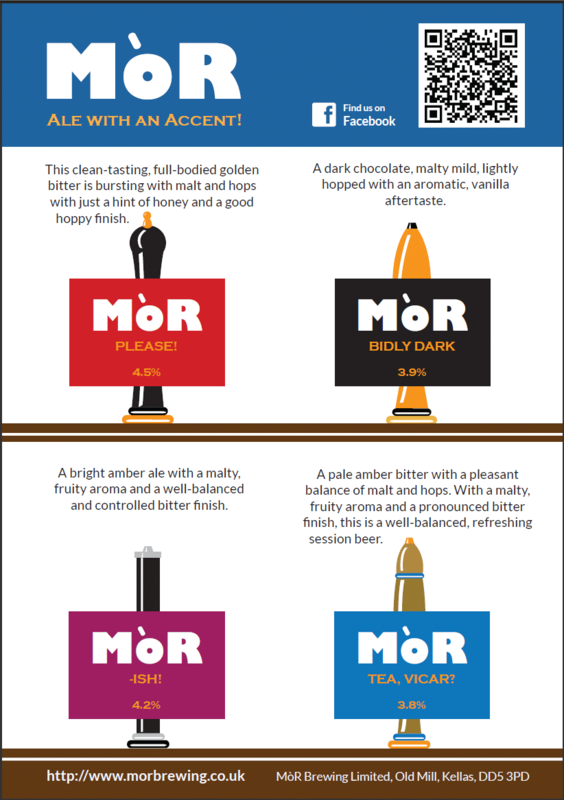 So it was to be full colour, “creative but simple”, and had to feature the details of the four ales that are the mainstay of the MòR brewing range. After a trying a few different ideas, we settled on the concept of the beer pumps, in a very simple colourful style that would compliment the bold two-color pump clips that MòR usually use for their beers.